Please visit the GA2018 website. 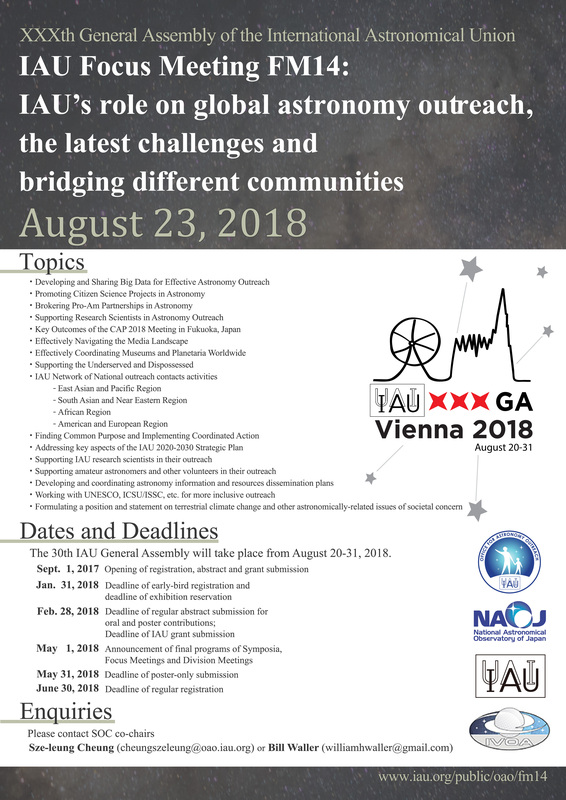 The 2018 IAU General Assembly in Vienna provides an important opportunity for research astronomers and outreach professionals to jointly consider the IAU’s role in global astronomy outreach. Our goal is to enable and coordinate outreach for the greatest good worldwide. We will share what is already being done and discuss what we could do better going forward. All participants in the GA are welcome to join in the discussions. There will be four oral sessions on Thursday, 23 August, each session lasting 1.5 hours. The sessions will each feature a mix of invited and contributed talks, some of which will be in the form of panel discussions. 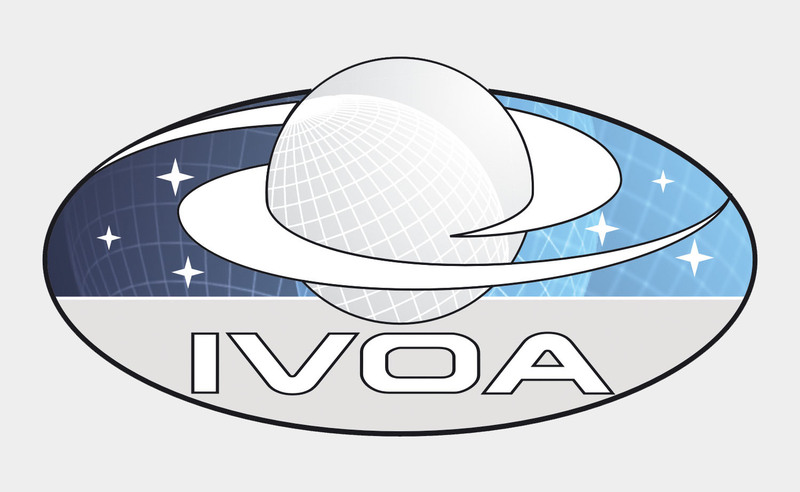 All participants will be charged with recommending ways the IAU can better advance astronomy outreach worldwide. There will also be a dedicated poster session on Friday, 24 August. No transportation is provided, participants are expected to travel to the Museum by themselves. Please register here for the FM14 reception and social event. Posters can be mounted during Aug 20 - 23. All posters has to be unmounted by Aug 23 17:30. The poster presenters are expected to standby at their posters to interact with each other. For those who are unfamiliar with LaTeX, You can download the free TexMaker software to use, simply open the above template and replace the text in the source code. 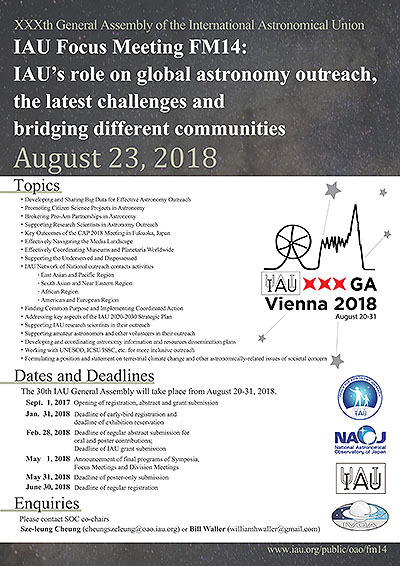 The 30th IAU General Assembly will take place from August 20-31, 2018. Please register and submit your abstract on GA2018 site. More information on the IAU GA2018 page. Please contact Sze-leung Cheung (cheungszeleung@oao.iau.org) and Bill Waller (williamhwaller@gmail.com).